At Hammond Aesthetic & General Dentistry in Utah County, we treat every patient as our special guest. While you’re with us, won’t you please kick off your shoes and enjoy a chilled juice or perhaps your favorite soda? We are baking and serving fresh bread and melt-in-your-mouth Otis Spunkmeyer chocolate chip cookies all day long. Please help yourself. You may also choose from more than 15 varieties of tea, as well as hot chocolate. Our treatment rooms have back massage pads on the chairs, as well as heated neck support pillows. Put on a pair of our dark glasses, as well as a one of our iPods. We don’t have your favorite song or album? Let us buy it for you on iTunes! Don’t forget to spend a few minutes in our “Zen Room” and try the massage chair, spa fragrances, and quiet music or satellite television. You may not want to leave! 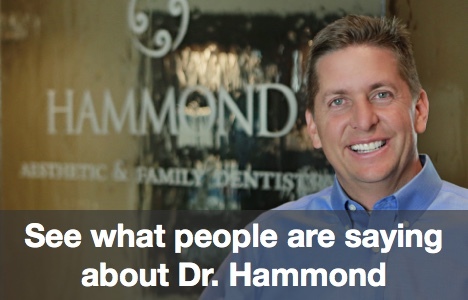 Learn more about Dr. Hammond and find out more about Hammond Aesthetic & Family Dentistry office in Provo, Utah. Our award-winning doctor is second to none! During your stay, consider trying our hot paraffin treatment for luxuriously soft baby-like hands. At the end of your visit, you’ll be handed a steaming hot lemon-scented cotton facecloth to freshen up. Dentistry absolutely need not be anything less than a pampering, pleasant experience. Why Is Hammond Aesthetic & General Dentistry in the Orem Area in Such Demand? Please call Hammond Aesthetic & General Dentistry office in Utah County, and any one of our team members will be happy to help you. We know you will be delighted not only with the treatment you receive, but with the way you are treated. We can help you with any questions, or set up an appointment. We look forward to making your acquaintance and having you here as our guest.